The Great Pyrenees is a large dog breed with a solid muscular body and has an overall elegant, imposing, even majestic look. Originally developed to tend sheep on mountain slopes, it is both strong and agile. 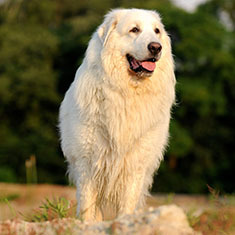 The Great Pyrenees double coat is weather resistant and allows him to withstand cold temperatures. Intelligent and loyal, the Great Pyrenees is very protective of its family. The Great Pyrenees originated in France. Male Great Pyrenees range from 27 inches to 32 inches. Female Great Pyrenees range from 25 inches to 29 inches. Male Great Pyrenees range from 100 to 125 pounds. Female Great Pyrenees range from 90 to 115 pounds. Great Pyrenees are typically white or white with grey or tan markings. 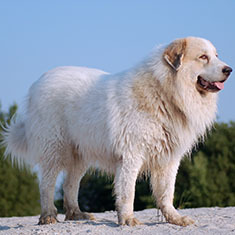 Great Pyrenees have a long double coat with a course outer coat and a dense undercoat. Daily brushing is required throughout the year, however extra grooming is necessary throughout the shedding season. The Great Pyrenees is a steady, independent dog breed who is loyal to its owners. Watchful and alert, the Great Pyrenees tends to be suspicious of strangers. The owner of a Great Pyrenees should be confident and patient since this dog breed is very territorial and not easy to train. The Great Pyrenees is susceptible to hip dysplasia, skin conditions and epilepsy. The expected life span of the Great Pyrenees is 10-12 years. Great Pyrenees do best in a country home with a fenced yard. Regular exercise is essential for this dog breed. The Great Pyrenees is in the Working group. Find Great Pyrenees Puppies with our Free Breeder search!